Lately, I have tile on my brain due to a couple of projects on my plate right now. When you think of spaces needing tile work — functional or decorative — you usually think of the bathroom and the kitchen, but today we’ll focus on the bathroom. Now, the handsome husband and I have yet to redo any bathrooms in this house. The last time we did a bathroom for ourselves was when we lived in our starter Nashville ranch in 2008. In that house, we gutted and tiled the bathroom ourselves (with the help of my über handy dad) and did a basic Home Depot subway tile with a tiny pencil border for the wainscot and the tub/shower, along with a classic hex tile that I’d gotten off eBay. It was simple, classic, and budget. 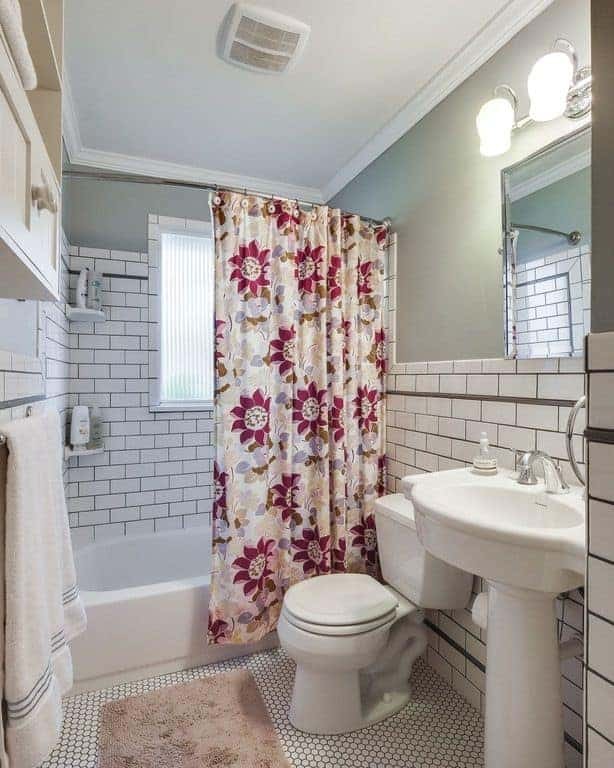 We didn’t get fancy, just lots of white tile and pale paint above and a funky shower curtain. All the non-moveable stuff was as light and airy as possible — which is what people generally want in a small master (in our case, only) bathroom. Here’s the bathroom as it was on Zillow in 2015 when the house went on the market again. Yep, that’s our happy shower curtain, still there through another set of owners. I did this 8 years before I became a decorator, so be kind. 😉 I probably wouldn’t do the dark grout now, or at least do smaller spacing, but it hid mildew and dirt. Also, now that I have 2 crazy boys and am forever seeking calm, I’d probably do a white shower curtain, perhaps with some lavender trim. Back then, though, I was just seeking something happy. Part of the learning process! BTW, that beige bathroom mat was totally the new owners’ fault. Very off. Blech. Come on, people!! White, or grey, or any color from the shower curtain would have been fine!!! Otherwise it is just the same as when we redid it. Today, I would have done something similar to the below regarding the grout. 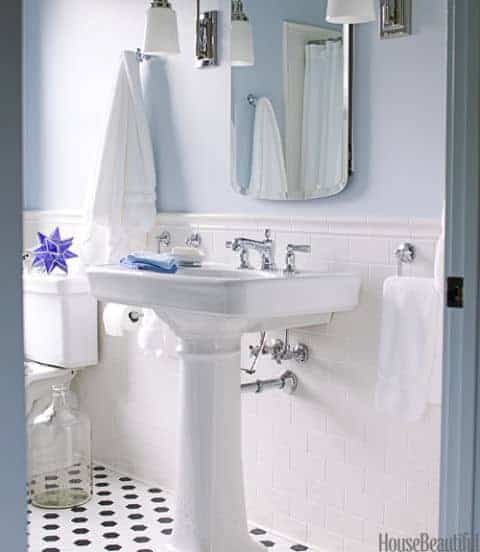 You can never go wrong with a classic white bathroom, especially for resale. If you are on a budget and need to redo a bathroom, I completely recommend this look. Bead board or other millwork wainscot falls into this budget-but-always-classic category, too. Anywho! Don’t get me wrong. I don’t only advocate for “safe” choices. I LOVE a creative bathroom. This one was pinned a million times when it came out in House Beautiful. But this bath has a few of things going for it. Obviously, money was no object to these homeowners and the designer was a rock star. This bathroom has enough space to be able to carry a multitude of patterns/designs. It’s a big bathroom. All of the tiles relate to each other. 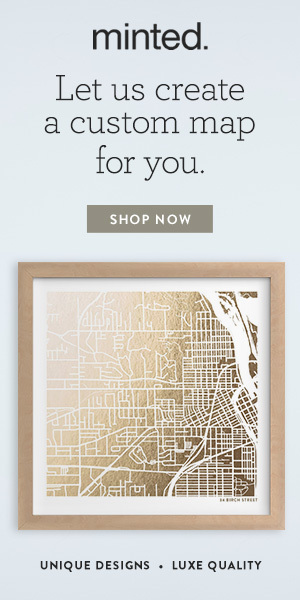 But what if you lack the big money and the ace designer or your bathroom lacks the square footage, but you still want your bathroom to have a little visual interest? It’s easy to make mistakes you later regret, but I have some simple solutions that can serve as your compass as you embark on your bathroom odyssey. BIG DISCLAIMER: I don’t want to hurt anyone’s feelings, but I do have a professional opinion. That’s why people do or don’t hire me. If what you’ve done with your own bathroom falls under one of these “mistakes,” remember my too-dark-too-big grout mistake in my own Nashville bathroom. If you disagree with me and love all of the examples I use, it’s your house! Do what you love. Now, the mistakes to avoid…. Growing up, I was never one of the cool kids. Most of us weren’t. But there was always that kid who wasn’t cool, but tried really hard to be. That’s what the too-many-tile-pattern bathrooms remind me of — trying to be really cool, but just never quite getting it. If the main floor tile was too big to create a slope for the drain, used the square marble tile for the shower walls and shower floor, making the shower enclosure consistent. I see 5 different tile treatments in this bath. Using the same type of tile for shower and bathtub wall surround was a good choice, but couldn’t they have chosen just one tile treatment for the whole floor? The cobblestones don’t relate to anything anyway. Oh, this looks like a really expensive mistake to me…. Or a type of “Magic Eye” picture. Please, give your eyes a break. Cleanse your tile palette to no more than 3 patterns. And make sure the shapes/colors relate to each other. Edit! You can even do one pattern you love and give it the all-over treatment, like Nina Farmer did above. Emily Henderson chose a simple blue scallop pattern for walls and a white tile for the floor to stunning effect in her small master bath. Here, the accent wall tile is repeated on the tub surround for balance. Floor tile is quiet but with a bit of grey interest, repeated in the minimalist window valences. Shower enclosure is a clean white throughout. Lovely and serene. One of the biggest problems I see on the internet when people redo bathrooms — most especially, but not exclusively, smaller bathrooms on a budget — is that they find a tile mosaic they love but of which they can’t afford much. 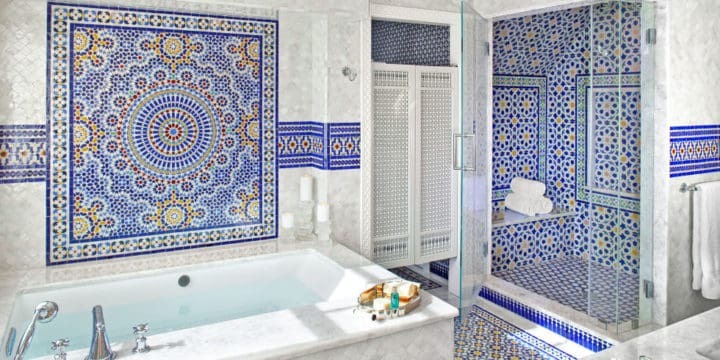 It’s like they saw the Moroccan-inspired billionaire’s bathroom, which is out of the price range of 99.999999% of people, but they wanted emulate it as best they could. So they take a type of mosaic tile, and “frame” it — usually in the shower or over the tub. I would have preferred a shower exclusively in the large tile. This seems choppy and random to me. That marble basket weave is nice, but it is not a feature mosaic like the medallion above the tub in our billion’s bathroom. Would have looked better on the floor. Same kind of thing. This is a gorgeous, happy waterjet marble mosaic that you can find at Tilebar and was used to beautiful effect in this kitchen. Unfortunately, used in this skimpy application, it looks out of place to me. This same kind of application is done even in really big, expensive bathrooms, and I still don’t like it. Just interrupts the flow, you know? The the rest of the below bathroom is lovely and spa-like, though. If it had all been done in the main tile, or if the three walls of the shower enclosure had been done in the chevron pattern, it would have been stunning. I wonder where the shower door went…? Here’s a stunning tile mosaic that is almost frame worthy, but I can’t help myself — I don’t like it framed either! The same goes for the floor, in my mind. No framed tilework on the floor, please! Beautiful tile. But beautiful or not, this looks just like the too small rug problem except that it’s in tile and much more permanent. Seriously, is there anything wrong with just putting a rug down in front of the bath tub? You know you’re going to put a rug or towel there anyway — no one wants drips all over the floor when then get out — and if you do, then you have a rug on top of a rug look. Here is a case where a framed bit of mosaic works, IMO. It works because there is an architectural reason for its being framed — the alcove — and not just because the designer slapped some pencil liner tile around it and called it a day. James Howard used this lovely mosaic like wallpaper on an accent wall. Not my favorite treatment in a small bathroom because it chops up the space, but if you can’t afford to do all the walls, this is aesthetically acceptable, IMO. Alla Akimova used this very cool chevron tile for the floor — all the floor — even when it went into the shower. Your eye follows the pattern without stop (who cares about the shower threshold) and receives the impression that the room is bigger than it actually is. Another James Howard classic bath with tile going to a chair rail. Tile up to a chair rail is always good. Mosaic is on the entire floor. Very daring and fun bathroom (though the black accents are a bit much for me, personally). While there are only 2 types of tile, they are used in 3 different patterns for 3 architectural spaces — one for the walls, one for the shower enclosure, and a simple pattern for the floor. I think it works well. Tile above wainscot works beautifully, too! Floor mosaic is repeated as a border below a chair rail, which continues as a sink backsplash. Classic floor border — notice how it goes around all the corners; it’s not just a framed rectangle floating in the middle of the floor. A lot of these gorgeous, fancy tiles cost quite a pretty penny. What if you can’t afford to do an entire “architectural element” in one of them? If that’s the case, what’s so bad about some pretty white ceramic or porcelain tile in the shower/tub, a simple tile on the floor, and paint? Absolutely nothing. If you want visual interest, put it in your shower curtain, or your Roman shades, or a great vintage rug. You’ll never regret going classic with your fixed features. What are your thoughts? Agree, disagree? Questions? I’d love to hear from you! I really enjoy writing this blog, but as you can imagine, writing something of this length each week takes quite a bit of time and research. I don’t have sponsored posts. I love hearing your comments and knowing that what I’ve learned through the years benefits somebody (I hope!). In June it will be one full year that I’ve been writing every Saturday. If you like what you read, please pass it on and share with others that might be interested and sign up to receive my weekly emails directly to your inbox! Next week, I’ll be back with a follow-up to this post. ‘Til next week. P.S. If anyone out there lives in the Boston metro area or the capital region of New Hampshire and is a 20th century music aficionado, I’ll be appearing with the Boston Cecilia on April 23rd at 4:00 at the St. Paul’s School (free concert) and April 30th at 4:00 at All Saints’ Parish in Brookline. Links and info below! hi Amy, I agree with every single word and photo in this post!! Spot on my friend! xxoj.